The DSRV-1 Mystic was a Deep Submergence Rescue Vehicle that was launched in early 1970. Designed to be easily transportable by air, the Mystic could descend to 5000 feet below the surface and carry up to 24 passengers at a time. In 2008, after nearly forty years of service, the Mystic was decommissioned having never been used for its original rescue mission. Another small release from Riich Models, this is very likely the only injection molded 1/350 DSRV-1 we'll see, so it's good that there's two in the box (even though only one was ever made, having two in the box gives the option to display the Mystic in a couple of different scenes). This is a small model, but it is surprisingly well detailed. 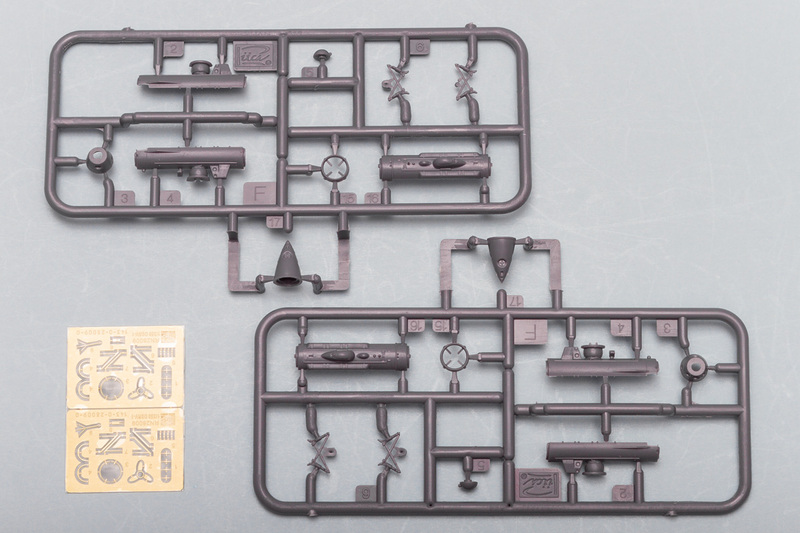 You get a sprue of plastic parts and a fret of photoetch, with the overall construction being fairly straightforward. Starting with the main hull assembly, this is made up from three main pieces, which then get a separate nose and tail piece. The nose piece has photoetch impellers that fit into recesses in the plastic piece. The other photoetch parts cover railings found on the mating collar, the main propeller at the rear, and some of the finer detailing on the hull, as well as the bracing struts. While the kit is nicely done in terms of molding and detail, one area that is a major letdown is in the colors and markings. The kit does not come with any decals, and the only color information comes on the box. The Mystic carried quite a bit of markings, from the name of the submarine to various individual markings. The colors are also unique, with the vessel finished in an overall greenish color, with orange accents. Having these colors defined through drawings, and have the smaller details covered in decals, would have been an immense improvement on this kit. While the kit seems incomplete without decals, the overall quality is pretty good and this will look impressive sitting on the back of a Los Angeles Class SSN. My thanks to Dragon Models USA for the review sample.